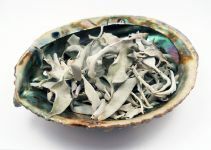 Sage Smudge is dried sage, as you burn the sage (in a shell or census) you move through the space wafting the sacred smoke, the smoke transforms negative energy into positive and drives away any unwanted energetic influences. Each pack of smudge comes with an instructional leaflet, giving you the basic information to do your own space clearing. Blue Sage "Grandmother Sage" Loose for Smudging by "Fluorescent Ranch"